Ever hear about something that is a new trend and all the rage and think, “I’ve always done that?” One of the food trends for this year is for chefs to put the focus on vegetables. Similar to the whole “nose-to-tail” practice used in cooking meat, there is now a “root-to-stem” practice where no part of a vegetable or fruit goes to waste. Well, it may be a new trend in the culinary world but I’ve been cooking that way for years. Other people may lop off the tops of carrots, beets and radishes, throw away the fronds from a bulb of fennel, and discard the stalks from a head of broccoli, but I cook with all of it. With the price of food rising and the increased amount of food waste, it only makes sense to get the most out of the food we buy. The leaves, stems, stalks and skins of vegetables have their own unique tastes and textures so it’s like getting multiple veggies in one package. 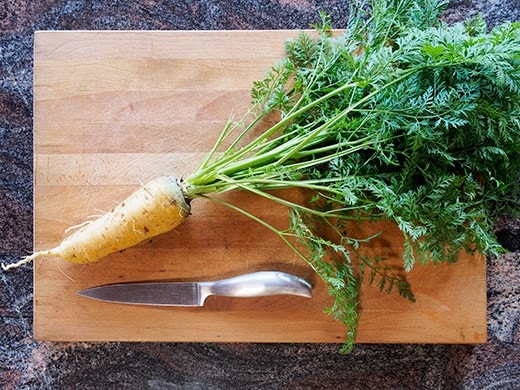 Here are some ways you can start cooking from root to stem. Whenever I cook asparagus, I trim the tough, woodsy ends off. Then they go in a storage bag into the freezer until it’s time to make stock. Add the stems to the pot with the celery, onions, and water. Season with herbs and spices, bring to a boil and simmer for at least half an hour. Strain and store in the freezer until you’re ready to use it. 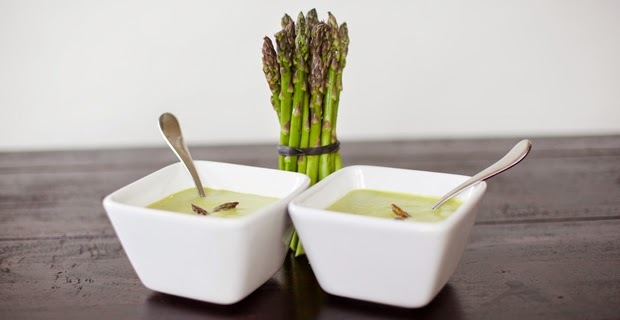 Or use the whole asparagus right away to make this delicious and refreshing Raw Asparagus Soup. Beets are delicious and so are the greens that come attached to them. 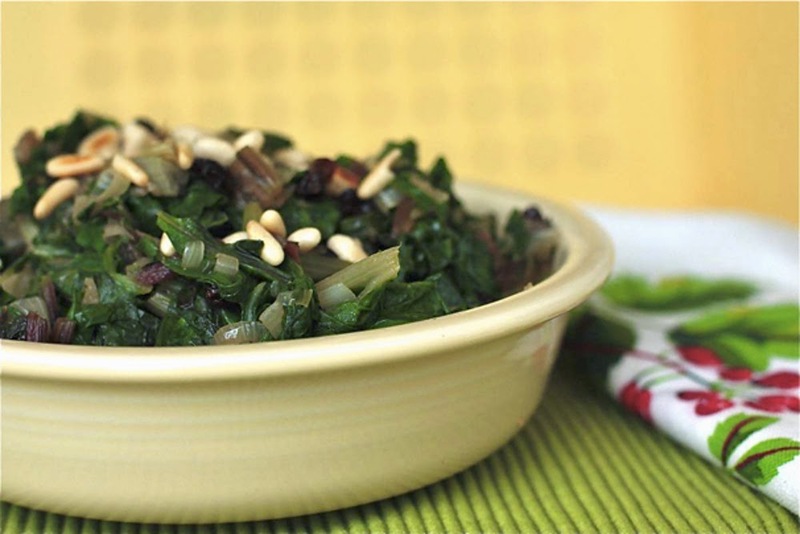 Use them to make Beet Greens Pesto or sauté them as in these Beet Greens with Garlic and Toasted Almonds and Sautéed Beet Red Greens. I love to use them to make a salad to go along with my Borscht soup. See more ways to use beet greens in Beet and Carrot Greens: How to Use Them Instead of Toss Them. There was a time when I preferred to buy broccoli crowns because I thought I was getting more edible food for my money. Then I realized that the broccoli stalks are delicious and really filling. Now I get upset if my broccoli doesn’t come with the stalks attached. When I cook broccoli, I cut off the florets and then get to work on the stalks. They can be peeled to remove the outer peel but I usually just chop them up and add them with the florets to whatever I’m cooking. Use the stalks in stir-fries and salads like this Broccoli Salad with Quinoa, Scallions and Roasted Cashews. Another way to use the stalks is to use a julienne peeler to make broccoli “noodles” or a regular peeler to shave the stalk into thin ribbons. 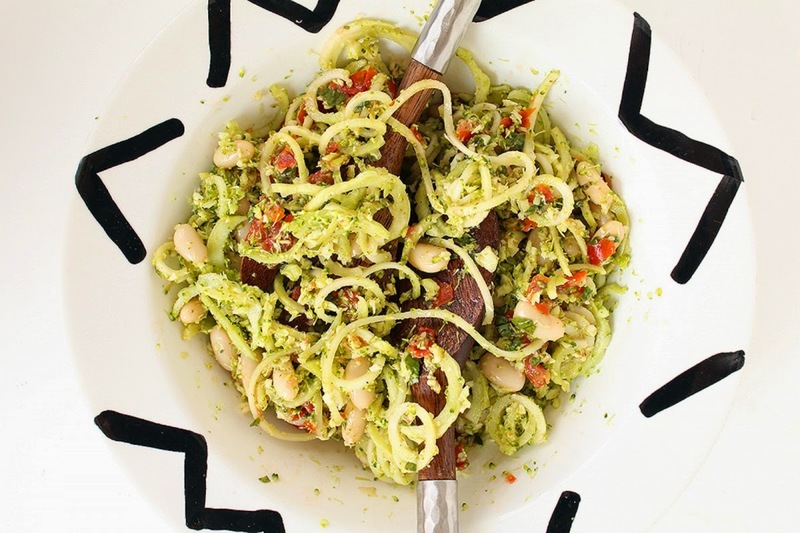 Use these noodles raw or cooked in lighter pasta dishes like this Tomato Basil Broccoli Noodle and White Bean Salad and this Tofu Scramble with Broccoli Noodles. The leaves are edible as well. 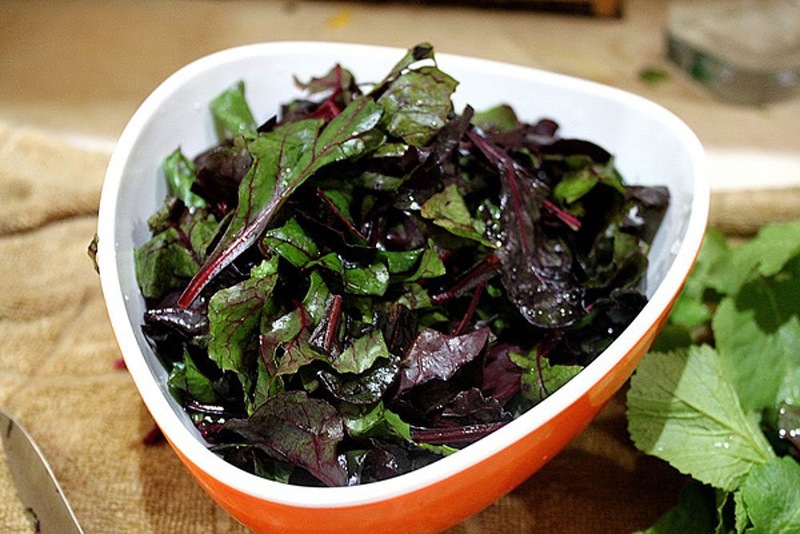 Add them to salads and stir-fries just as you would any other dark, leafy greens. When I was a kid, we fed the carrot tops to our parakeets. Today, I use them in lots of dishes. Carrot greens can be bitter so blanch them first. Use them to make pesto, vegetable stock, and salads. Add them to sautés, stir-fries and smoothies. Running low on parsley or cilantro? No problem! Carrot greens can stand in for them in recipes or as a garnish. See all the ways to use carrot tops in Beet and Carrot Greens: How to Use Them Instead of Toss Them. Cauliflower is hot right now. You knew that but did you know you can eat the stem and the leaves? Every time we read a cauliflower recipe, it tells us how to remove the leaves and cut the florets off the stem. When I cook cauliflower, I cut off the florets and then I chop up the stem and cook it with florets. It takes just as long to get tender as the florets do. You can also leave the stems attached when you cut the head of cauliflower into steaks as in this Cauliflower Piccata. The next time you make Roasted Buffalo Cauliflower Bites, leave the stems attached to the florets so you have a “handle” to hold each piece by. Use the leaves by adding them to the dish towards the end of cooking so they slightly wilt. Celery is an under-appreciated vegetable as it is; don’t make it feel even worse by throwing away its outer stalks and pretty, tender leaves. Every bit of the celery is edible. Use all the stalks, inner and outer, in your dishes. You can peel the stalks to make them less “stringy.” Make celery the main attraction as in this Braised Celery dish. Celery is very healthy, so add it to your smoothies and juices turn it into soup and enjoy it in this Onion, Celery and Mushroom Stuffing. 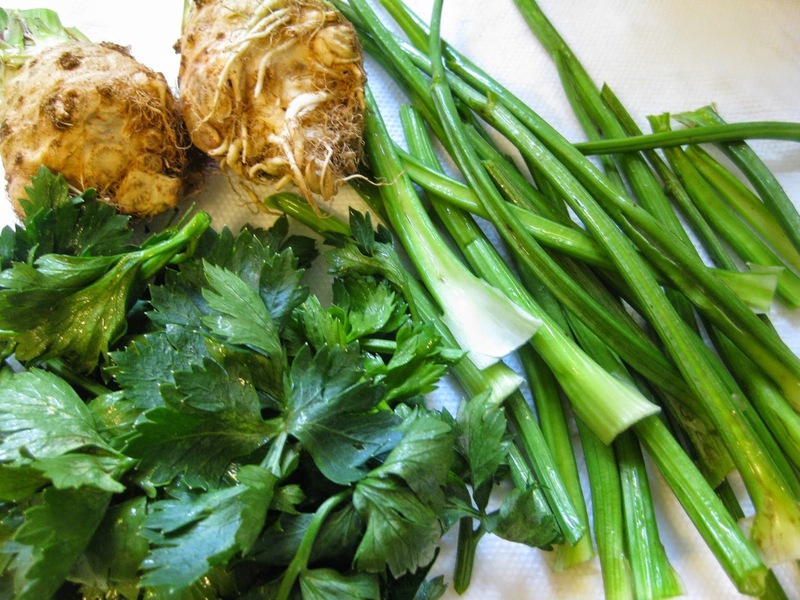 Use the celery leaves in soups and salads or as a garnish instead of parsley. Whenever I get rainbow chard, I make sure that I use the stems. They are too pretty to throw away! They can be blanched until tender and used to make pickled relishes. I like to chop them up and saute them before adding the greens in dishes like this yummy Swiss Chard with Onions, Currants and Pine Nuts and Gluten-Free Lemon Swiss Chard Pasta. Fennel can be used from bulb to fronds. The bulbs have overlapping layers of fennel, sort of like a cabbage. The stalks are similar to celery in both texture and crunch. The feathery fronds look like fresh dill but taste like anise and make a beautiful garnish. Fennel seeds can be bought whole or ground and add a bright note to dishes. 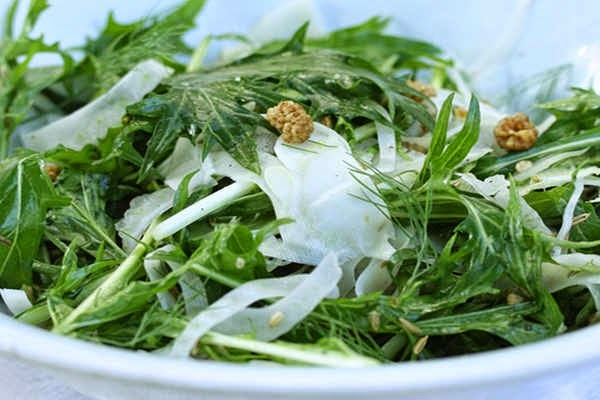 Check out 10 Ways to Cook with Fennel Tonight and then try this Orange Fennel Salad with Agave-Mustard Dressing, Mizuna, Fennel, and Mulberry Salad and Roasted Fennel. When I first cooked with jackfruit, recipe instructions said to cut the outer part of the sliced jackfruit away from the core and discard the core. That would have meant throwing away about half of the jackfruit that came in the can. I didn’t understand that since the core is really tender so I just cut up the entire slice and cooked it. Read Have You Tried Cooking With Jackfruit Yet? 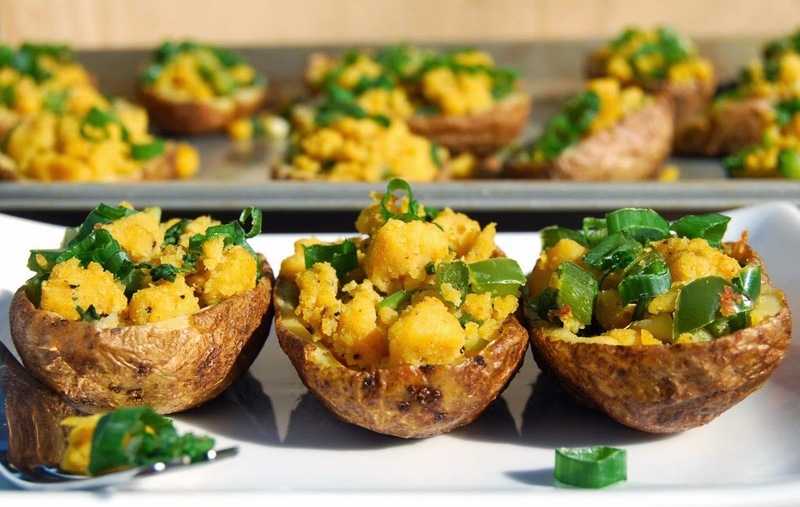 Get Started With These Recipes! 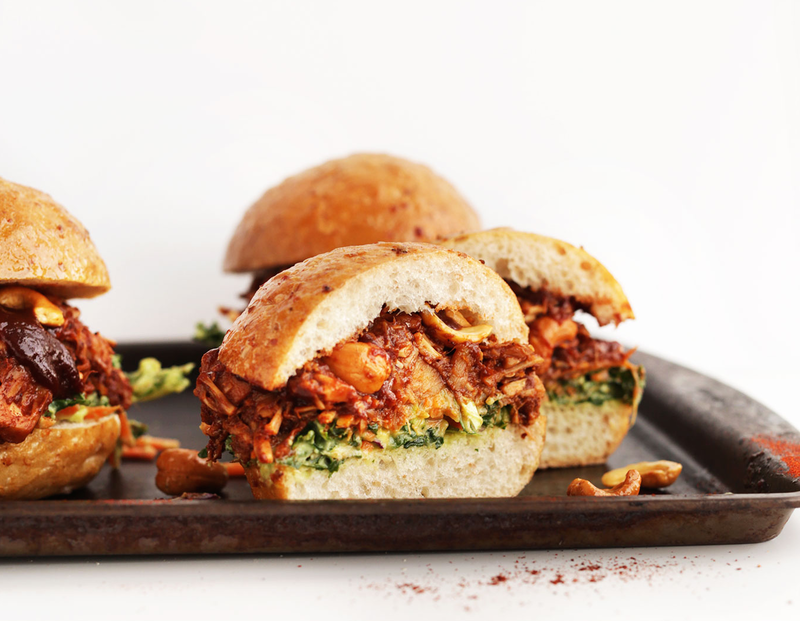 Then use the meat and the core to make Jackfruit Philly Cheesesteaks, Jackfruit Ropa Vieja, and BBQ Jackfruit. Leeks are relatives of onions and garlic, but they have a milder taste than either of them. They are most often used as an aromatic for soups and stews, but they can also be the main ingredient of dishes. Leeks can be eaten raw in salads, sautéed until tender, braised to make them soft and sweet or grilled until charred. Most recipes tell you to cut the green leaves off and discard them but they are edible and delicious. Cook them along with the rest of the leeks or cook them as you would other leafy greens. Use them to make this Pureed Lentil Dip with Caramelized Leeks, Sweet Potato, Carrot and Leek Soup, Cheesy Leek and Potato Gratin, and Mushroom and Leek Risotto With ‘Parmesan’ Tempeh. Like so many of my other vegetables, I don’t peel potatoes before cooking with them. I just scrub them clean and cook. If you do peel your potatoes, don’t throw the peels away. Cook them the same way you cook fries. You can fry them or you can bake them in the oven. Simply toss the peels with a bit of olive oil and seasonings – my choices are garlic powder, paprika, and black pepper. Then cook them in the oven for about 20-25 minutes at 425 degrees. When they are browned and crispy, sprinkle with kosher salt and munch away. They make a great snack or use them as a crunchy garnish as you would crispy fried onions. 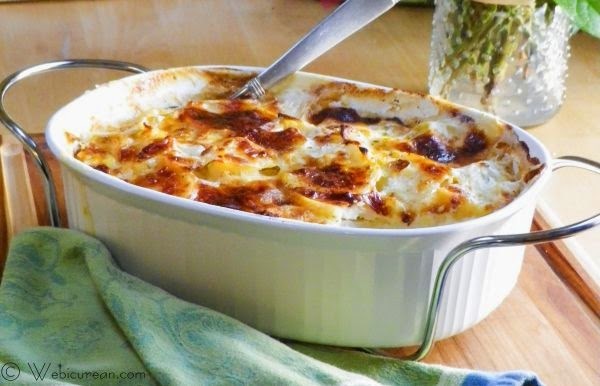 It’s like having Potato Skins or French Fries without the actual potato. One year I had a ton of radishes. The green leaves on radishes do not last long so you have to use them right away. I used the radishes to make my Caramelized Radishes and the leaves to make Radish Leaf Pesto that became an amazing pasta sauce. To make it: combine 4 cups fresh chopped radish leaves, ½ cup chopped walnuts, 3 cloves garlic, the zest and juice of half a lemon and 2 Tbs. vegan parmesan in a food processor. Stream in up to ¼ cup extra-virgin olive oil while processing the ingredients. When the pesto is smooth, season with kosher salt and black pepper to taste. When the pasta is al dente, reserve 1 cup of the cooking water and add it, little by little, to the pesto to loosen it up a bit. 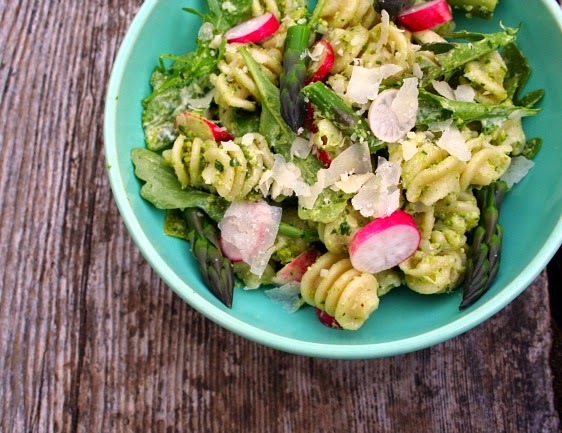 Toss the pasta in the pesto sauce and serve hot. Radish leaves can also be used in salads but they can be bitter so you might want to blanch them first. Learning how to use all the parts of a vegetable is like trying new foods. When we cook from root to stem, we not only lessen the amount of food we waste but we gain a larger variety of healthy and delicious dishes we can make. Try it and let us know how it goes.